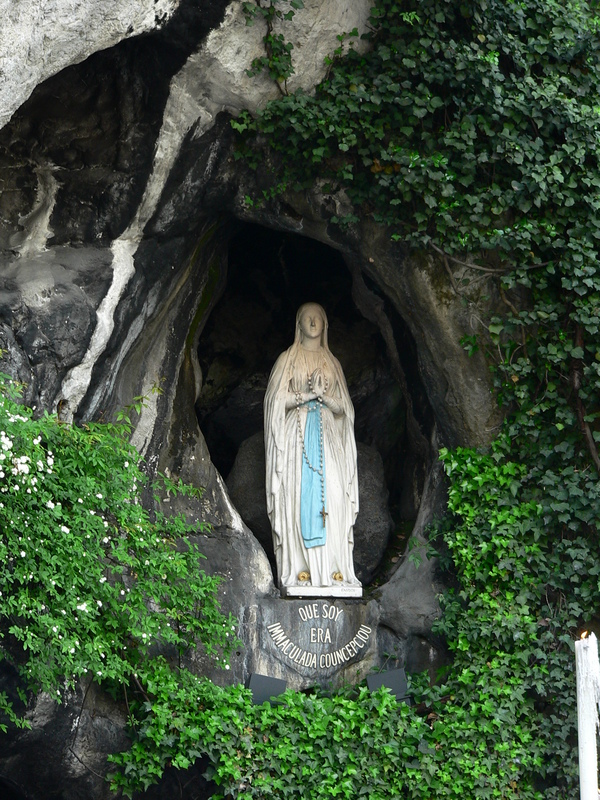 Since the Apparitions in Lourdes in 1858 people from all over the world have travelled to the Grotto in the South of France. Groups of Pilgrims from this country are recorded as going to Lourdes in the 1870’s. However it was not until 1913 that the first organised National Pilgrimage from Ireland travelled. In the autumn of 1912 the Bishop of Derry Dr. Charles McHugh first mooted the idea of a National Pilgrimage while attending a meeting of the Hierarchy at Maynooth. Cardinal Michael Logue gave his approval and Bishop McHugh was appointed as Chairman of an organising committee. Each Irish Diocese nominated a priest to serve with Bishop McHugh. Thomas Cook & Co. was appointed as travel agents and they made all the arrangements. The task of organising the Pilgrimage was a huge one. It was envisaged that Pilgrims would travel from every Diocese in the country and that proved to be the case. 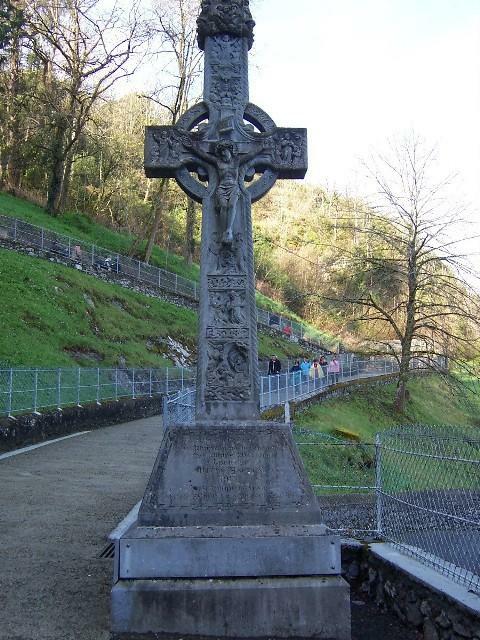 September 1913 was selected for the pilgrimage and it was hoped that the Irish party would be in Lourdes for the Feast of the Nativity of the Blessed Virgin, September 8th. Due to major French Army manoeuvres this date was put back by a week. The Pilgrimage group would have to travel by boat to England, cross England by train to Folkestone and then to France by boat once more. The final leg of the arduous trip was by train to Lourdes. In total over 2000 people travelled including 162 invalids. It was a particularly gruelling journey for the invalids. They were transferred seven times from train to boat to special hotels and then by boat and train again. Accommodation en route was arranged for the invalid group in London and Paris. Those travelling left from Larne Co. Antrim, Greenore Co. Louth, Dublin and Rosslare Co. Wexford. First, second and third class travel and hotels were available. The first class fare was £15 while third class cost £9 6s. 9d. Monday the 8th of September 1913 was Departure date with Friday the 19th the Return Date. Because the Invalid Section involved no night travelling in England or France their Special Section departed on Saturday September the 6th. The Pilgrimage organising committee decided that a fitting gift should be presented to the Shrine in Lourdes. A Celtic Cross was deemed to be suitable. Prof. William Scott head of Architecture in the National University sourced a beautiful Cross in Waterford. The cross of Kilkenny limestone had been carved by William Gaffney of Beresford St. in Waterford. Gaffney was in Lourdes on the Feast of the Exaltation of the Cross, Sunday September 14th when Cardinal Logue unveiled the Monument. A huge crowd including the Bishop of Lourdes and Tarbes were present for the ceremony. So proud were the Irish pilgrims of William Gaffney’s beautiful Celtic Cross that many lingered after the official unveiling and sang ‘A Nation Once Again’ and ‘God Save Ireland’.! The Pilgrimage was a fantastic success and, amazingly made a profit of £14,953 5s. 4d.! In October Bishop McHugh wrote to Archbishop Walsh of Dublin offering a sum of £2000 from the Pilgrimage Profits to assist the Dublin Childrens Distress Fund -this was during the infamous Dublin Trade Union Lock- out. Rev. Francis Murphy C.C., Midleton was on the Pilgrimage. He organised a series of Lectures and Sacred Concerts after the Pilgrimage. One was held in Midleton in October and another in Youghal in December. A second Irish National Pilgrimage was planned for 1916 but historical events overtook that venture. 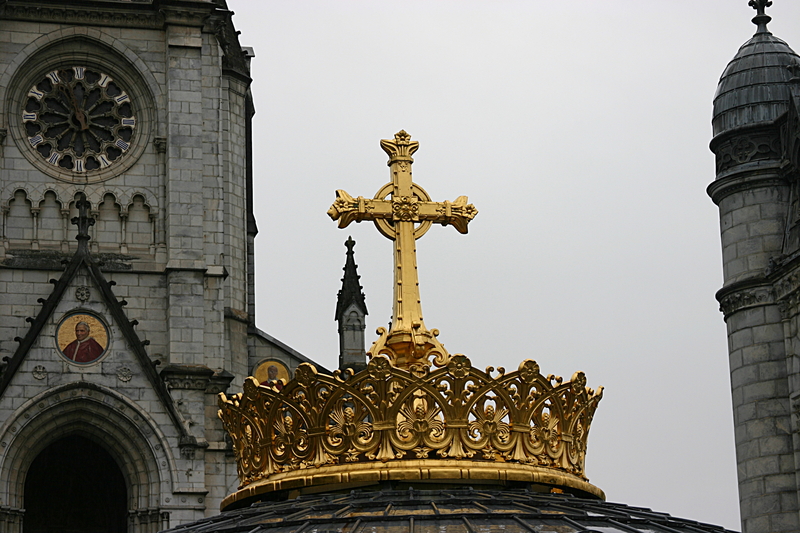 When the second Irish Pilgrimage eventually went to Lourdes in 1924 the gold cross and crown over the Rosary Basilica were presented as gifts on behalf of the Irish people. On this date in 1858 Bernadette Soubirous received her First Holy Communion. Years later in the Convent at Nevers she said, “My job is to be sick” – a strange thing to say wasn’t it? Yet during her short life she suffered more than most. Here in Lourdes you see suffering in all its manifestations. This morning we had the International Mass at ten o clock in the underground Basilica of St. Pius X. By half nine our ninety assisted pilgrims were all in the basilica with thousands of others in wheelchairs and voitures. People say ‘You were great to go to Lourdes’ and ‘you must have great faith’. Well as I looked around at the vast gathering of people with various ailments, I had my personal doubts. Why do people get terrible diseases, cancer and the like, why do people die suddenly, why do some suffer mental and physical torture for years, why, why, why? What is the role of God in all this? Mass took an hour and a half so I had plenty time to ponder upon these things, to doubt, to question what is life and death and suffering all about. On this first Sunday of June 2012 I didn’t come up with any answers. In Lourdes we discover penance and poverty and prayer but the mystery of life remains. We may think of pain, disease, illness, suffering and death, as ‘evil’ but there is also so much good in the world. Lourdes brings good and evil into sharp focus. All around I see hundreds of people, ordinary people, tending to the needs of others. Our Cloyne youth helpers are marvellous. Two weeks ago they were in school; happy, laughing, young people. Now they are in Lourdes, working tirelessly to help the sick and infirm – but they are still the same bright, cheery, marvellous, teenagers. I hope many will come back here again and again in the future. Still raining after Mass, dreary, so everyone was glad of a cup of tea in the Hospital. Busy day today. At two we have the passage through the Grotto then the Stations of the Cross and after that the Eucharistic Procession. Had a quick lunch in the Louis de France – a grand bit of beef, back at the Hospital shortly after one. We’re on the fourth floor so it takes a while to get all our patients down to ground level. All line up behind the Cloyne banner for our journey to the Grotto – thinking of Denis Dineen* of Ballyvourney who’s not well, he often carried this same banner. The passage through the Grotto is a very intimate and private event as people touch the ‘wall’ and feel the water trickling down the cold black rock. All the ‘remember me at the Grotto’ and ‘pray for me at the Grotto’ requests come crowding in at this moment. The rain is light as we wait to start the Stations of the Cross. It’s three o clock here, two at home – I’m thinking in silence of next Sunday; Cork and Kerry in the Park and the Sunday after when I hope to climb Galtymore for MS Ireland – man proposes and God disposes. Fr. Eugene Baker leads our group of twenty assisted pilgrims on the Way of the Cross. He links each Station to some aspect of life, trials, limitations of middle and old age, suffering, lending a helping hand, hope and faith – a prayerful and humbling experience. Because of the weather the Eucharistic procession is in the Underground Basilica -we are reminded of the Congress starting in Dublin next week. Sunday night sees a lovely ceremony in the Transit lounge of the Hospital where Lourdes helpers are presented with Service Medals. There is bingo for the patients. Fine crowd over from the Hotels for ‘tay and a chat’. After a lovely quiet time at the Grotto where I sit and kneel and pray and just take it all in, I head out of the Domain close to midnight. Spend a few hours at the singsong in the Little Flower bar and restaurant. The singing and recitations are brilliant. One man has all of us in tears with his Paul Robeson-like version of ‘Kevin Barry’ and ‘A Mothers Love’s a Blessing’ – I shake his hand and he tells me of his very serious illness, God bless you Donie. Writing ‘til nearly three o clock. Article written by John Arnold. 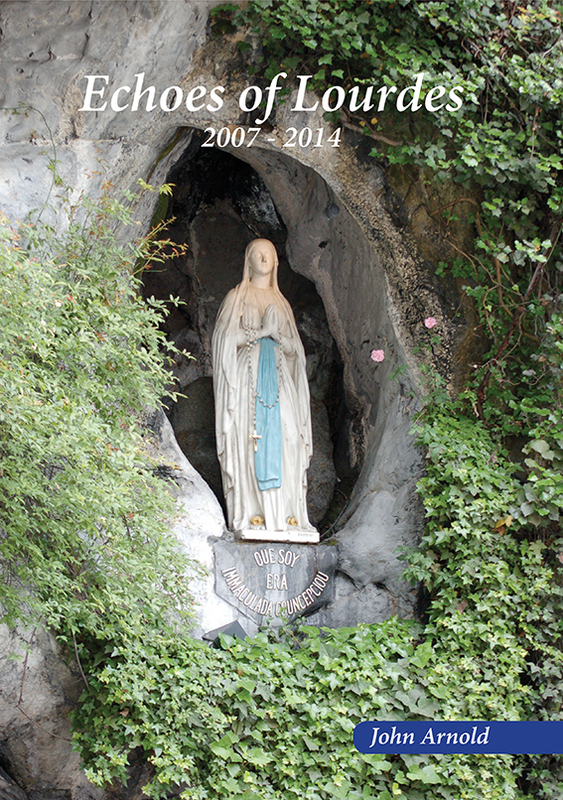 To inquire about a publication date for his book Echoes of Lourdes contact John at 087-953-8077.